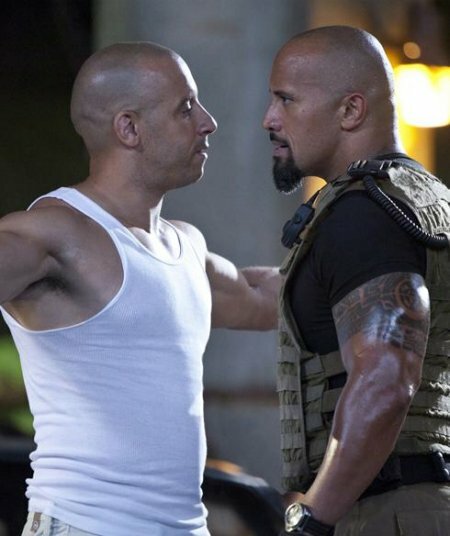 For those of us who have always had trouble distinguishing between the careers of Dwayne Johnson and Vin Diesel, their team-up in Fast Five presents a real problem. It's not that we won't be able to tell the two of them apart in the movie-- they've both got the bald, ambiguously ethnic meathead thing going on, but they do look pretty different-- but that years from now, when we try to remember which one of them was in Fast Five, we'll go around in circles until finally realizing, for once, it was both of them. To start burning it into your head now that the two will be sharing the screen, USA Today has released the first image from Fast Five, which hits theaters April 29 this year. They also talked to director Justin Lin about Johnson joining the franchise, and he made a pretty good point about what it was about the Fast and Furious name brand longevity: "That's pretty amazing, for a star like him to join the fifth part of a franchise. That says a lot about him and the fans." Now that Paul Walker's and Vin Diesel's characters have teamed up, Johnson is on board for Fast Five to play the cop on their trail, following them to Brazil for surely more fast-driving action and trash talk. As Lin puts it, "If you're going to do a Fast and Furious movie, you've got to go bigger each time. People thought it would be impossible to get Dwayne. But he didn't show up looking to cash a paycheck." To read more about the movie and Lin's admission that "I'm not a big car guy" and the movie, for him, is about family, click on the larger image below and check out the full USA Today article. Presumably we should also expect a Fast Five trailer out before too long, maybe in front of one the January action releases?